When we talk about internet or any network or networking, the first thing comes in our mind is ip address.Today here i am going to brief IP.There are a lot of confusion among newbie reated to IP,IP ADDRESS and IP ADDRESSING.Some think IP and IP ADDRESS are two different thing,but some think both are same.Few are confused when people talk about IP ADDRESSING. If you want o understand the INTERNET or any NETWORK you must know what IP is.That’s why today i have decided to write a short note on IP here. IP is communication protocol of TCP/IP suit which is used within a network or outside a network or between two or more networks. 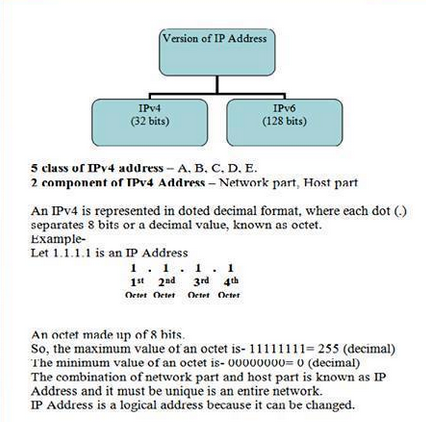 IP ADDRESS is a numeric address used by communicating device using TCP/IP suite for the purpose of communication and it also to define a device uniquely in a network(which means in a network no two device can have same ip address). It is just an addressing structure to implement IP ADDRESS. Public Address – Unique Address That Is Assigned To A Company. Private Address – Theses Addresses are Not Recognized By The Internet And Can Be Used By Anyone Within Their Private Network.